We have officially made it to spring. Unfortunately the weather seems to keep forgetting that it is no longer winter. Here in NW Arkansas, we will have a couple of days of nice weather followed by almost freezing again. My solution? Finish knitting the sweater for my husband. That has to make the temperatures start rising, right? The main body of the sweater is finished and I have cast on one of the sleeves. I am happy with the way the pieces are looking so far. I do feel that the sleeves would have been better to have been knit in the round, but I chose to follow the directions and leave them knit flat. I am sure that this will make attaching them to the body easier. I haven’t been making enough time to knit lately. Shame on me, but that gives me something to work on. This is what my evenings have been looking like lately. 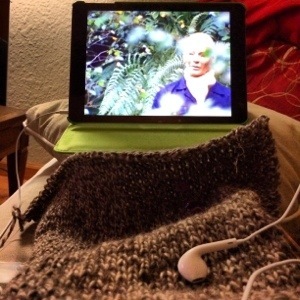 Staying up later than I should while knitting and watching classic Doctor Who. My husband and I celebrated our 6 year wedding anniversary. The weekend before, we went out to a nice dinner with our little fella and bought a couple of movies to watch at home. 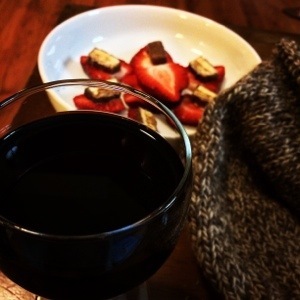 We also had wine and strawberries and chocolate while watching the movies. And of course I had my knitting! 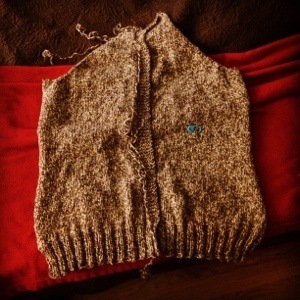 Yesterday was a sad day as I unraveled the Fog sweater. 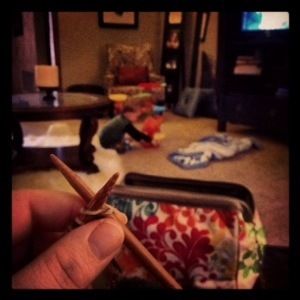 I was very impressed that I had a difficult time finding all my woven ends. I had to make my own end in a few spots because I wasn’t able to find the ends! That is quite an accomplishment for me since weaving ends is my biggest challenge in knitting. I feel like no matter what I do, they are always obvious. Maybe it was just the yarn, but I will take it! 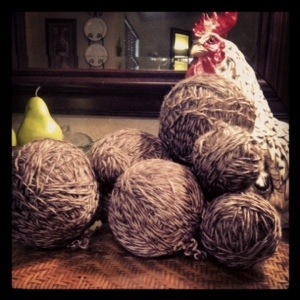 I ended up with several balls of Cascade Ecological Wool to make a whole new project. I found an awesome sweater to knit and then started reading the pattern which actually called for a DK weight. Eco is a bulky so it was not a great choice for this pattern and really I felt the pattern would get lost in the color anyway. I did some more digging and found the Bethel Woods Cardigan by Lionbrand. It is a relatively plain cardigan which I like because it will be able to be worn with a lot of things. I might make a miniature version for Jonathan if I have enough yarn left over. Since we are having another sick day, I have managed to cast on the back and knit about an inch of ribbing so far. I foresee a lot of knitting in my future today. I’m feeling a lot better but I’m still exhausted. The pictures below are all of the balls that the fog sweater made and me casting in while watching The Chew while Jonathan played quietly.